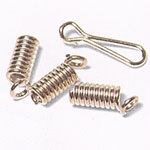 Spring end connectors (also known as coil ends) are the jewelry findings that are most often used to put a good finish to thick cord or leather jewelry pieces. These are also sometimes referred to by its more generic term "leather crimps". 1) Cut your cord/thong to your desired length. Remember that the springend connector will add some length to your finished jewelry. After threading on the beads etc. that you want for your design, push one end of your thong into a spring-end as far as it will go. 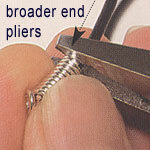 2) Once your thong is in place, use a blunt-nose plier to squeeze the last row of the springend over the thong. Make sure it is tight enough so that the cord will not slip out but not so tight that it breaks or squeezes the cord out of shape. To test, try to pull the cord and spring-end slightly apart. 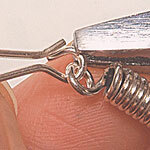 If loose, use the plier to tighten the last row of the spring-end over the cord again. If crimped correctly, you should see that the cord, where it meets the spring-end, is slightly depressed. A broader ended flat nose plier would be helpful. Repeat this procedure at the other end of the thong. 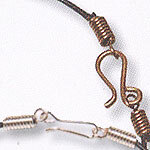 3) Add a hook of some form to a spring-end at one end of the jewellery piece. You can use a variety of hooks for finishing, including self-made hooks.